40′ Grade B Painted Ground Level Container — Tidewater Storage Trailers and Rentals, Inc.
We will meet any storage need. 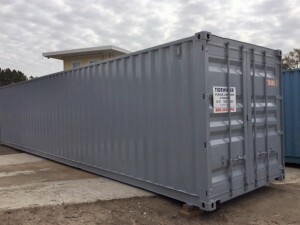 40′ Grade B Ground Level Container – painted a primer gray color. We use high quality industrial enamel paint and all containers are painted using a roller for better coverage. Containers are wind and water tight, forklift capable floor, very good seals around doors, and four locking latches. Call for pricing 910-763-7000. This entry was posted on Tuesday, August 14th, 2018 at 9:18 am	and is filed under 40', containers. You can follow any responses to this entry through the RSS 2.0 feed. You can leave a response, or trackback from your own site. Meeting Your Onsite Storage Needs for 35 Years.